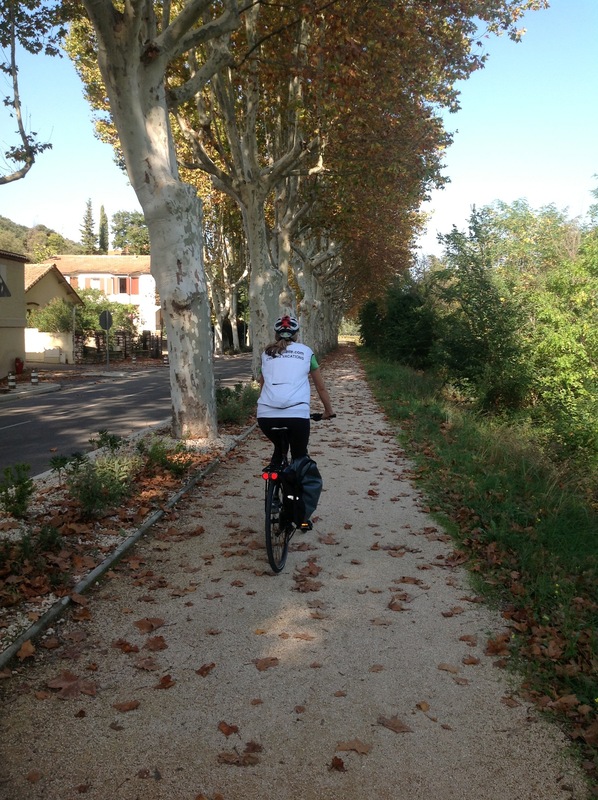 Cycling in Provence, the Wilderness of France! On this unique Provence bike tour, the heart of France will be your canvas and your bicycle will be your means to explore. 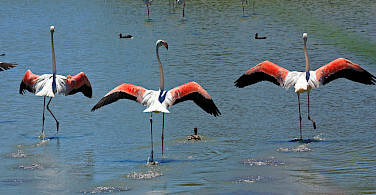 Provence is one of the most fascinating regions in Europe, a land of incredible natural diversity and home to pink flamingos, herons, cormorants and more than 400 species of other birds. 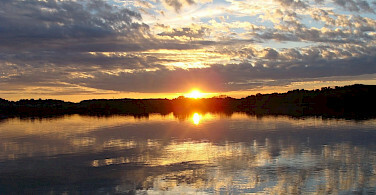 The vast wetland plains, ponds and rice paddies are protected against the modern world. 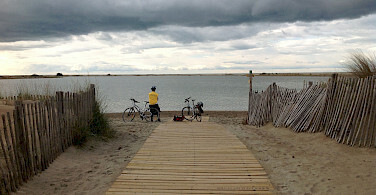 You will bike and boat through a land of salt marshes, rich in flora, fauna and wildlife, a country in itself with its long horned black bulls, white horses, gypsies, and Camargue cowboys. 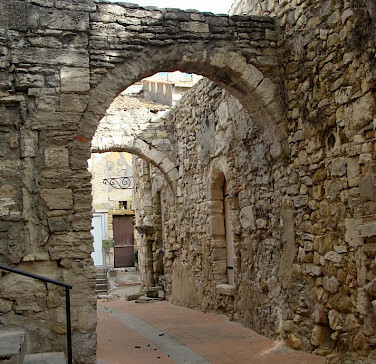 Highlights of this unique bike tour in Provence include the medieval fortress town of Aigues-Mortes and the Gallo-Roman city of Arles which dates back to the 7th Century with its major Roman sites. This was home to Van Gogh where he produced about 300 drawings and paintings, among them "Bedroom in Arles." 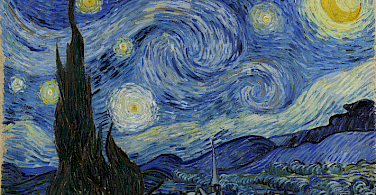 Inspired by the vibrant light of the region, he also created "Starry Night" which he painted on the plains at the northern edge of the Alpilles Mountains. 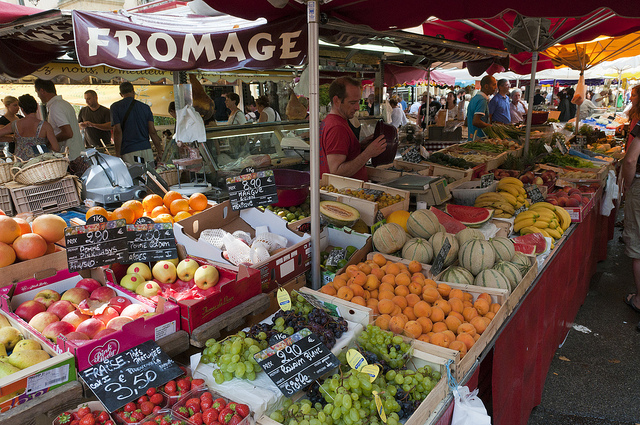 You will also bike in Avignon, the heart of Provence, also known as The “Windy City” stretches in all its beauty on the left bank of the Rhône river. 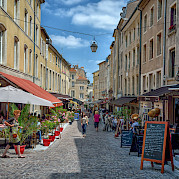 Avignon is one of the few French cities to have preserved its ramparts; its historic center, with the amazing Palace of the Popes and the 12 C cathedral Notre-Dame-des-Doms, is an ideal place to wander about in search of beautiful surprises. Please read the daily itinerary below to learn more about what you will see and experience as you motor through Provence waterways. 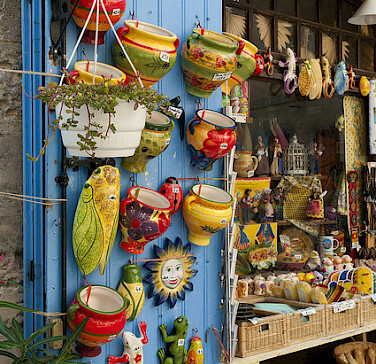 We hope you enjoy this wonderful and diverse Provence bike tour full of color, texture, history and contrast! 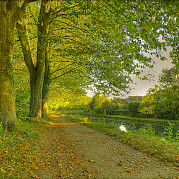 Be sure to check out our full list of Bike and Barge tours in France. There are 8 e bikes available for each departure. E bikes will be confirmed on first come first serve basis. 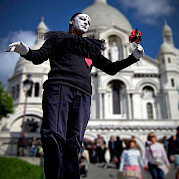 Fly to Paris (CDG), Avignon (AVN), or Montpellier (MPL) airports. 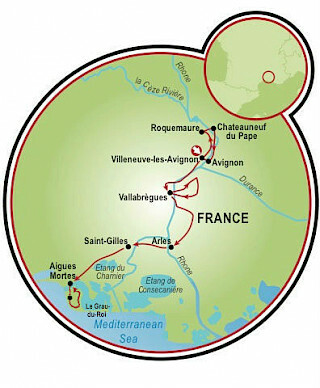 Total travel time from Paris to Avignon or Aigues Mortes is about 4 to 5 hours. Travel cost is about €100. Total travel time from Avignon or Montpellier is 30 to 90 minutes. Cost is about €30 to €50. 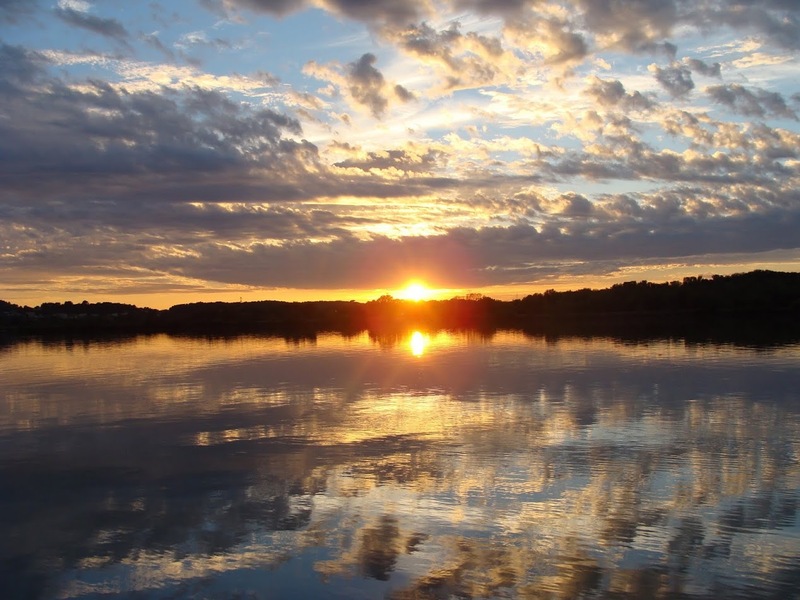 Average high/low temperatures in degrees F for the region are: April, 67°/45°; May, 74°/51°; June, 82°/58°; July, 87°/61°; August, 87°/60°; September, 78°/57°; and October; 68°/49°. 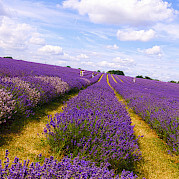 This Provence bike tour is classified as easy to moderate on country roads. Average daily distances between 18 and 37 miles (30 and 62 km). Individual arrival in Avignon and boarding during the afternoon. 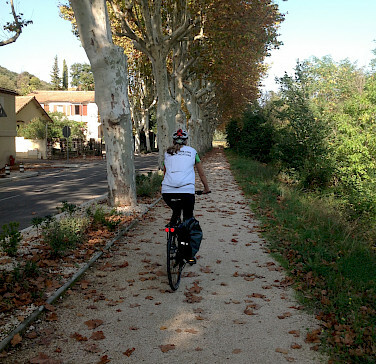 Your Provence bike tour begins with a cruise up to Roquemaure or a cruise during breakfast to Avignon crossing the Rhône river and continues on bike in the direction of Châteauneuf-du-Pape. Following scenic country roads with little traffic and surrounded by vineyards, you will have to face some rolling landscapes before getting to Châteauneuf- du-Pape, but once you are there, you will never want to leave. After a visit to the ruined fortress of the Popes on the top of the village, a tasting of the most prestigious of all the Rhône wines can be organized if you desire. The cycle to Villeneuve will lead you through Avignon, giving you the opportunity to bike along its unique ramparts and to admire its legendary broken bridge (the Pont St-Bénézet). 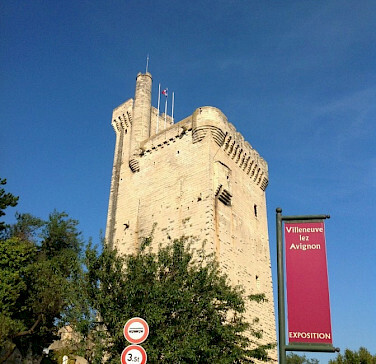 Your tour today will start in Villeneuve-lès-Avignon, which lies just in front of its elder “sister”, Avignon along the other bank of the Rhône. 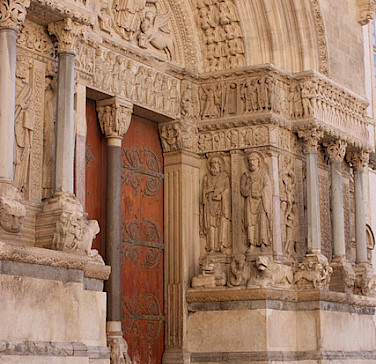 Avignon’s architecture is marked by papal history since in the early 14th century, the pontifical court was exiled to France. 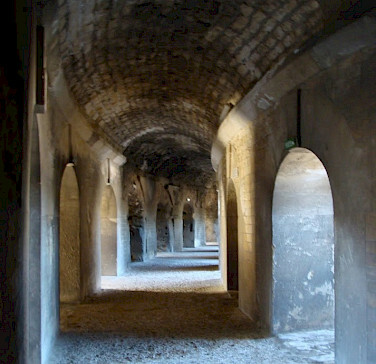 The cardinals, arriving at the papal court and finding no accommodation in Avignon, began to build magnificent residences across the river in Villeneuve (“new town”). The best place to enjoy Villeneuve, when you can catch a great view of the town including Avignon and the Mont Ventoux, is from the upper terrace of the Tour Philippe-le-Bel. 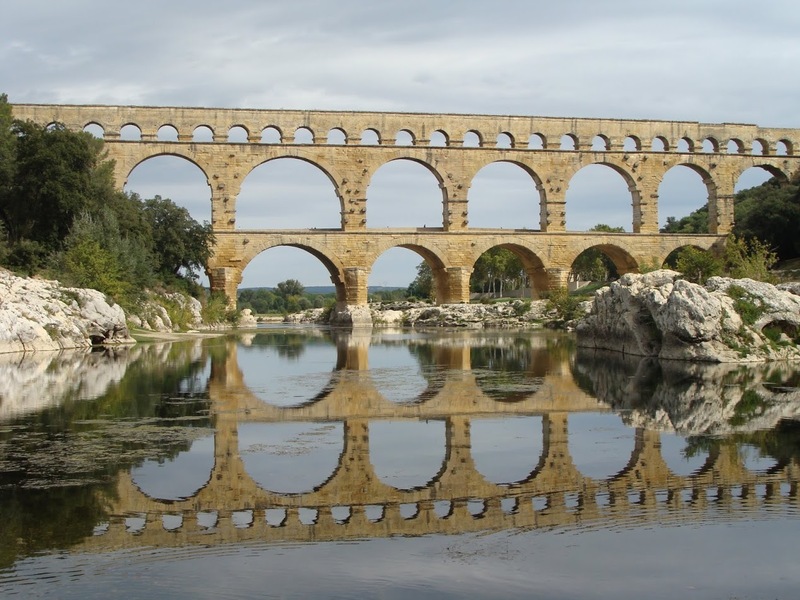 Continuing on, you will be lead through a hilly landscape to the best-preserved Roman aqueduct in all of Europe, the Pont du Gard. 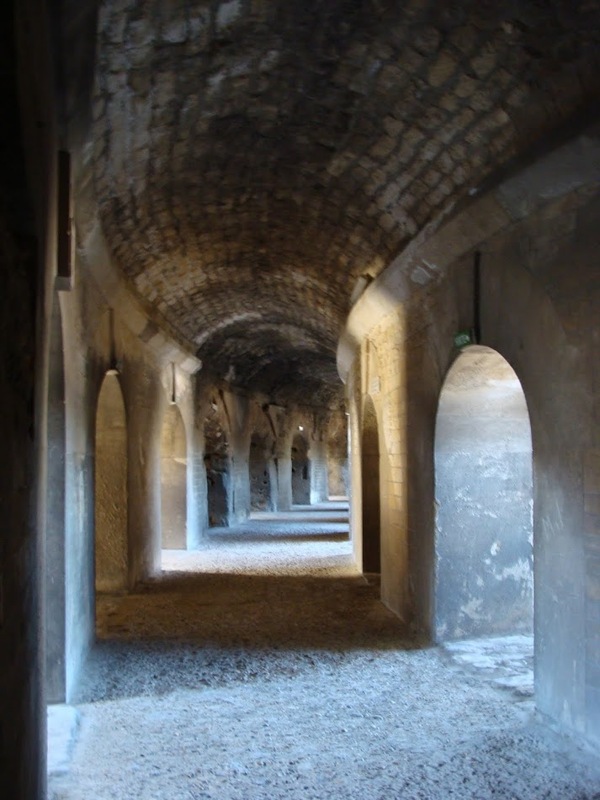 This bridge, with its three levels of stone arches, spans the Gardon Valley, being part of an aqueduct built during the 1st century in order to transport water from the Eure spring near Uzès to the Roman town of Nîmes, a distance of over 50 kilometers. In the afternoon, passing by ancient villages and hillside vineyards, you will arrive in the fascinating little town of Vallabrègues. Today's cycling route will give you a chance to get acquainted with one of the most intact landscapes of Provence, a paradise for walkers, mushroom gatherers, and hunters. 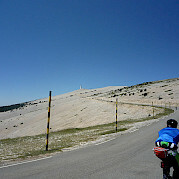 Along rustic roads you will ride to Boulbon, a typical medieval village nestled within the folds of the La Montagnette. You will also cycle to the magnificent Abbey of Saint-Michel-de-Frigolet, and then down to the 17th-century castle of Barbentane, at the confluence of the Rhône and the Durance rivers. In spite of the several ups and downs, this spectacular route won’t disappoint you. Starting in Vallabrègues, a village on the banks of the Rhône, you will pass a landscape of limestone cliffs, flower fields, and olive trees. 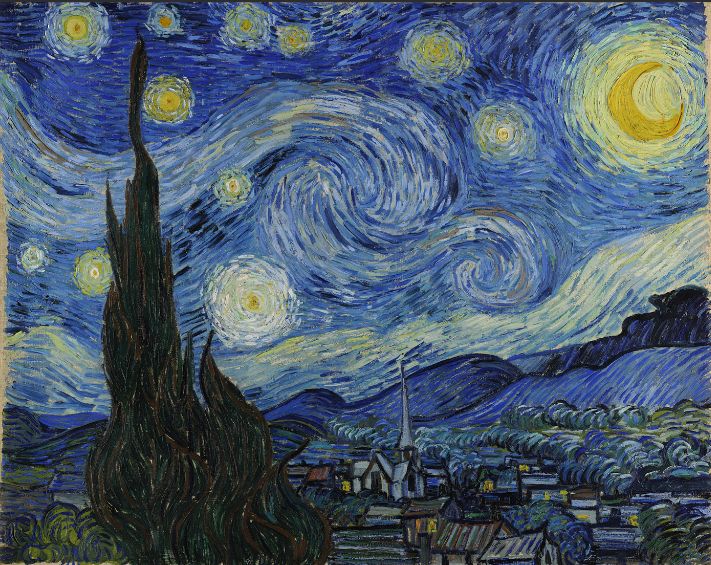 Located on the plains at the northern edge of the Alpilles, 20 km south of Avignon, is where Van Gogh painted Starry Night. If you wish to avoid the 4-km-long incline to Les Baux, you can go directly to St-Rémy following the road to the foot of the chain. Today's stage is more challenging than usual, but the breathtaking panoramic views are worth the sweat! 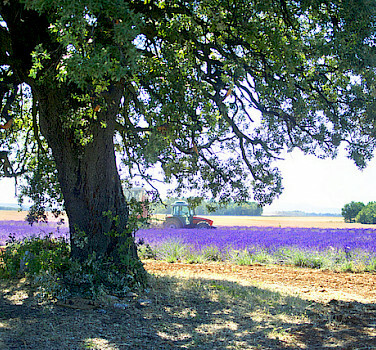 A long, downhill road will take you towards St-Rémy-de-Provence. Lodged in a bare rock spur detached from the Alpilles, the picturesque village of Les Baux-de-Provence, is one of the most popular tourist attractions in France. This stage will bring you through the chain of the Alpilles, whose arid peaks standing out against the blue sky are reminiscent of some Greek landscapes. The day ends in the beautiful town of Arles. 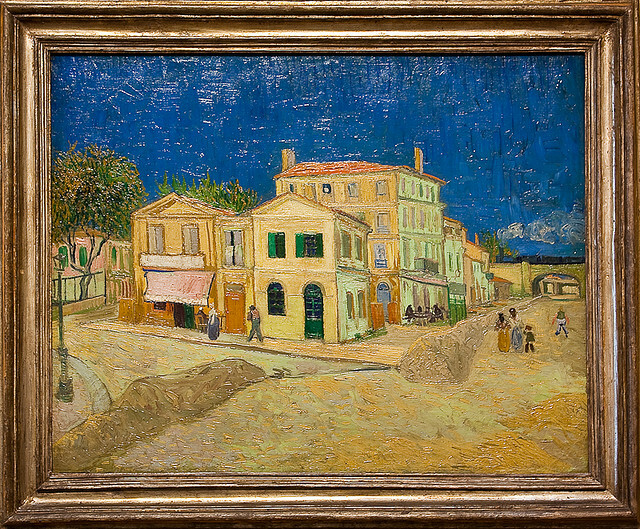 Arles and the ancient capital of Gaul with its beautiful Roman ruins are what inspired Van Gogh in several of his paintings. 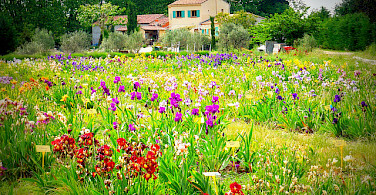 He sought to find “a different light” which the Provençal countryside and its luminosity provided. You will cycle among cane and rice fields on very pleasant and easy country roads with white horses and Camargue bulls as your companions. 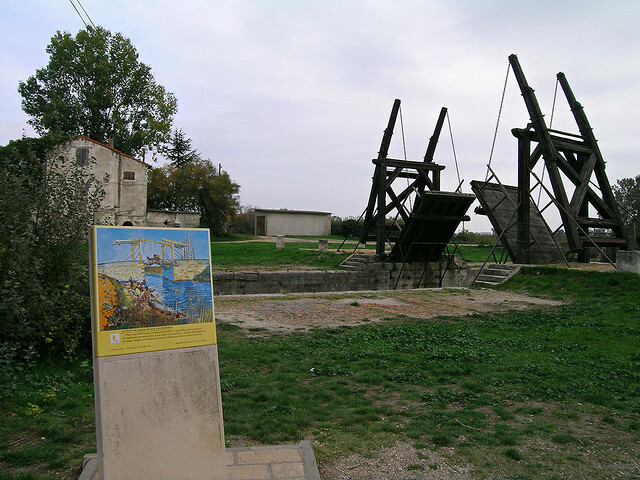 If you wish, you can cycle a 6 mile (10 km) loop in Arles, and visit the wooden drawbridge that the Dutch painter, Van Gogh, made known throughout the world. Today’s tour will finish with a cruise from Saint-Gilles to Aigues Mortes. 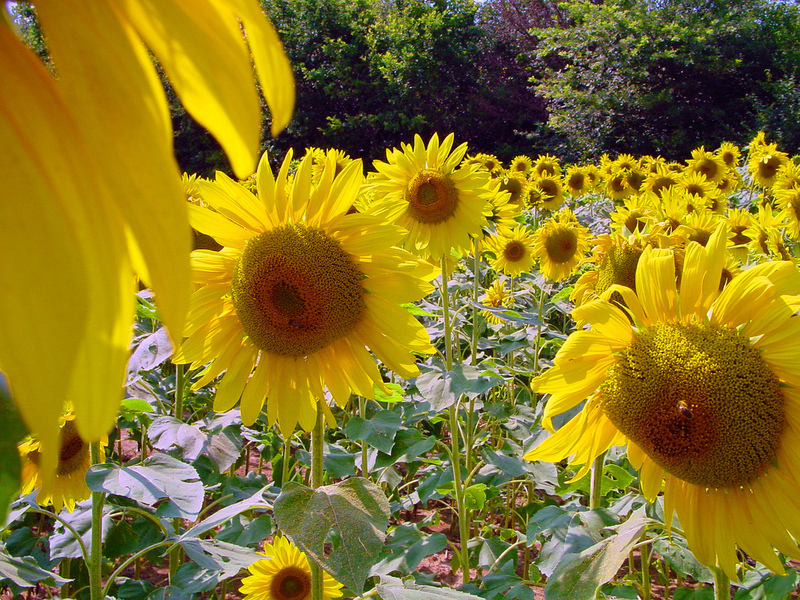 Or, if you wish to take advantage of the sunny weather and beauty of the region, you can lengthen today's route by cycling the entire route from Arles to Aigues-Mortes. Literally translated Aigues-Mortes means "dead waters", probably referring to the location of the town in the heart of the marshy Camargue region on France's Mediterranean coast. However, do not be deceived by this description. In this charming medieval town with its massive towers and walkable defensive curtain wall surrounding it, visitors can still wander about in a 13th century town. 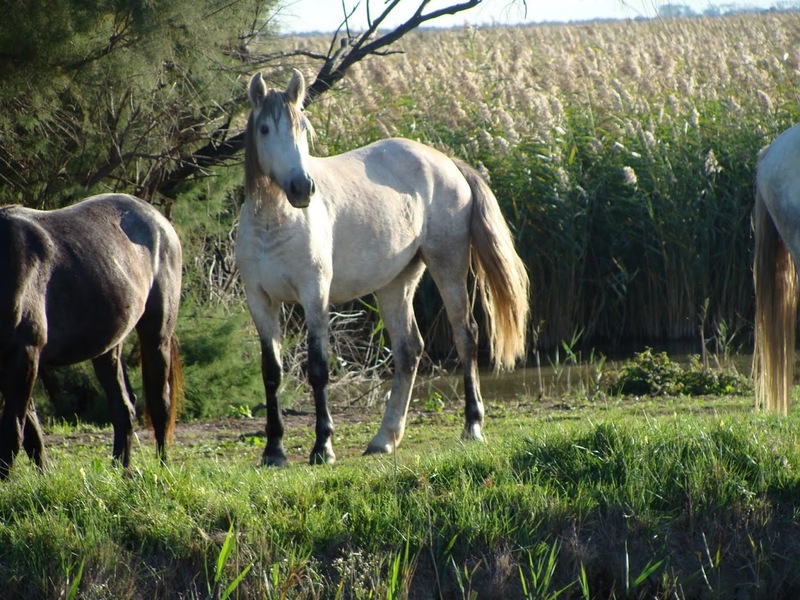 Today's cycling will provide the opportunity to explore Camargue, where nature still prevails over civilization. 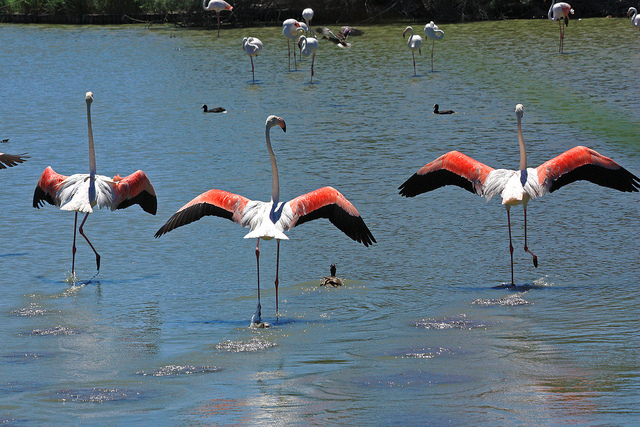 A quiet, uneven dirt road between a canal and some salty ponds, where you will probably see some flocks of pink flamingos feeding in the shallow waters, will lead you to the seaside village of Le-Grau-du-Roi. 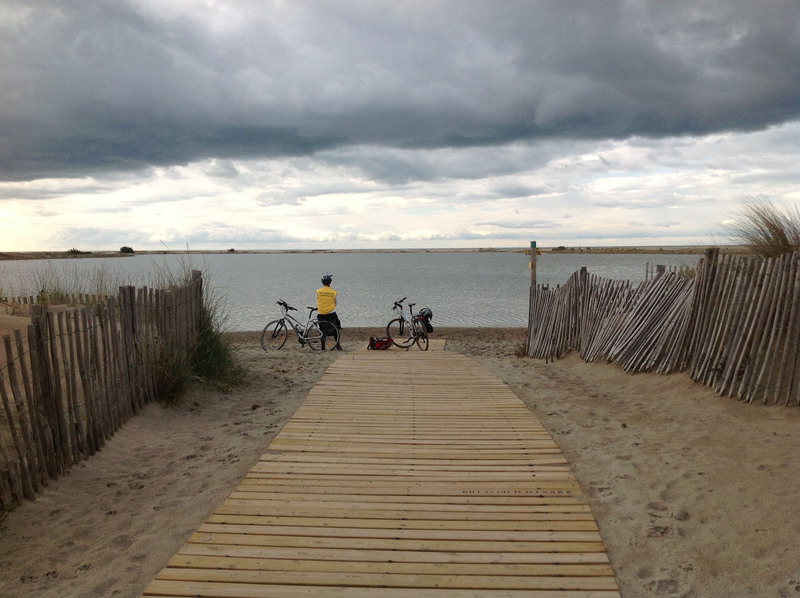 After an optional 13-km loop in a peaceful maritime pine forest, you can enjoy a rest on the beach of Le-Grau-du-Roi or continue cycling up to the wild windy beach of L'Espiguette. In the afternoon, you can't miss a visit to the incredible salt marshes on the way back to Aigues Mortes, where the production of salt goes back to Antiquity. 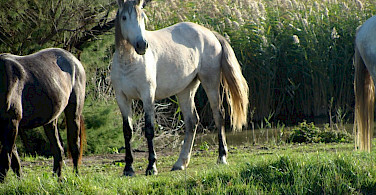 It's an easy, flat cycling day, which will make for a great first encounter with Camargue's beauty. You can also enjoy a refreshing swim in the Mediterranean Sea. 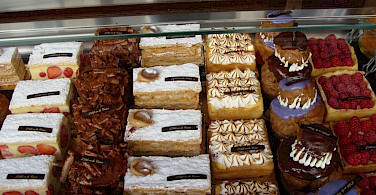 Your Provence bike tour will end after breakfast. Individual departure. Individual arrival and boarding in the afternoon. Today you can choose between two options. 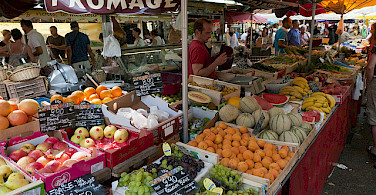 If you wish to cycle a shorter route, you can stay on board and cruise to Saint Gilles. 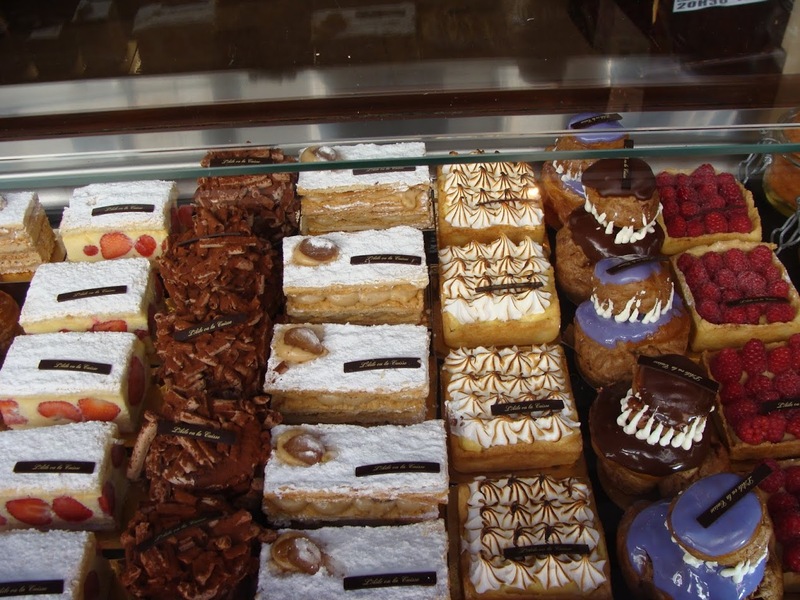 Or, if you wish to take advantage of the sunny weather and beauty of the region, you can lengthen today's route by cycling the entire route from Aigues-Mortes to Arles. 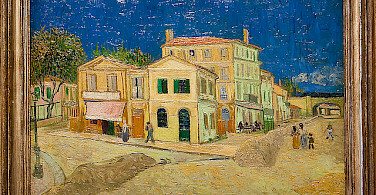 Arles and the ancient capital of Gaul with its beautiful Roman ruins are what inspired Van Gogh in several of his paintings. 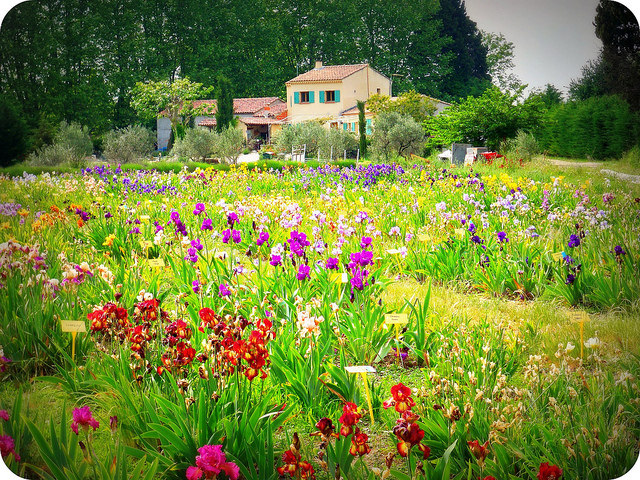 He sought to find “a different light” which the Provençal countryside and its luminosity provided. You will cycle among cane and rice fields on very pleasant and easy country roads with white horses and Camargue bulls as your companions. 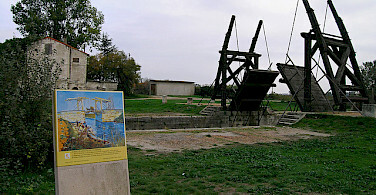 If you wish, you can cycle a 6-mile (10 km) loop in Arles, and visit the wooden drawbridge that the Dutch painter, Van Gogh, made known throughout the world. 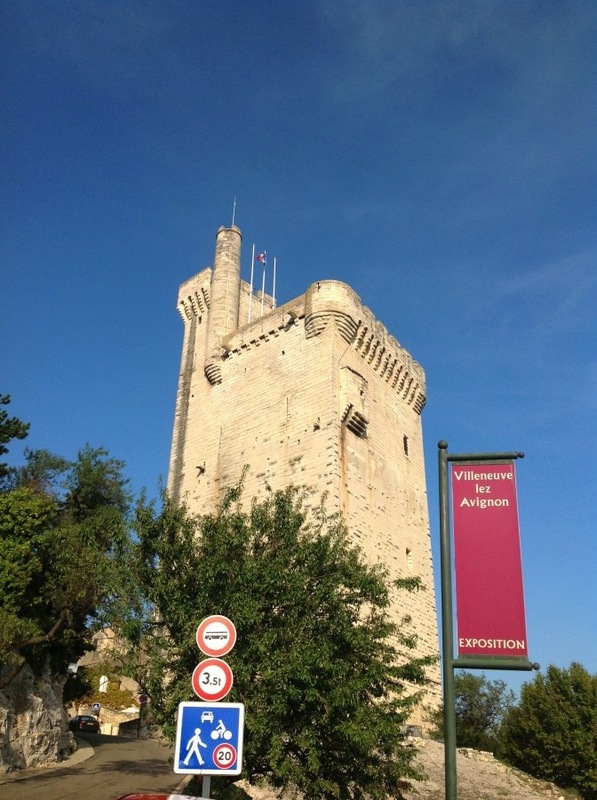 Day 4: Arles - Vallabrègues, 33 or 39 miles (56 or 62 km), longer option includes Fontvielle. The day begins in the beautiful town of Arles. You will cycle through the chain of the Alpilles, whose arid peaks standing out against the blue sky are reminiscent of some Greek landscapes. 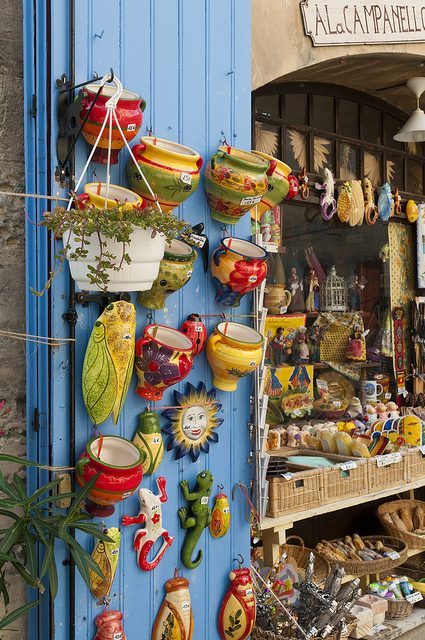 An uphill climb will take you towards St. Remy-de-Provence. Lodged in a bare rock spur detached from the Alpilles, the picturesque village of Les Baux-de-Provence is one of the most popular tourist attractions in France. Today's stage is more challenging than usual, but the breathtaking panoramic views are worth the sweat! You will pass a landscape of limestone cliffs, flower fields, and olive trees en route to Vallabrègues, a village on the banks of the Rhône. Located on the plains at the northern edge of the Alpilles, 20 km south of Avignon, it is where Van Gogh painted Starry Night. 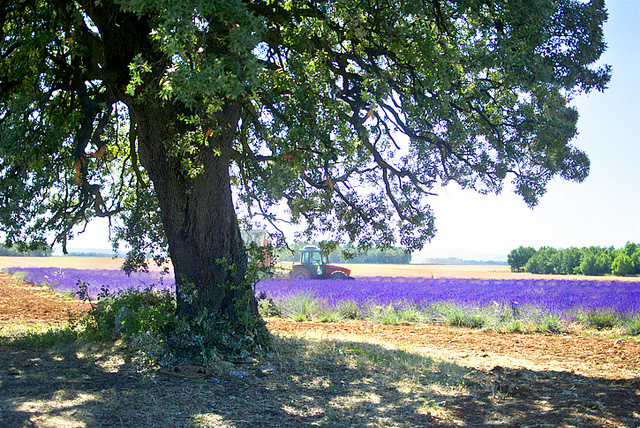 Today's cycling in Provence will give you a chance to get acquainted with one of the most intact landscapes of Provence, a paradise for walkers, mushroom gatherers, and hunters. Along rustic roads you will ride to Boulbon, a typical medieval village nestled within the folds of the La Montagnette. 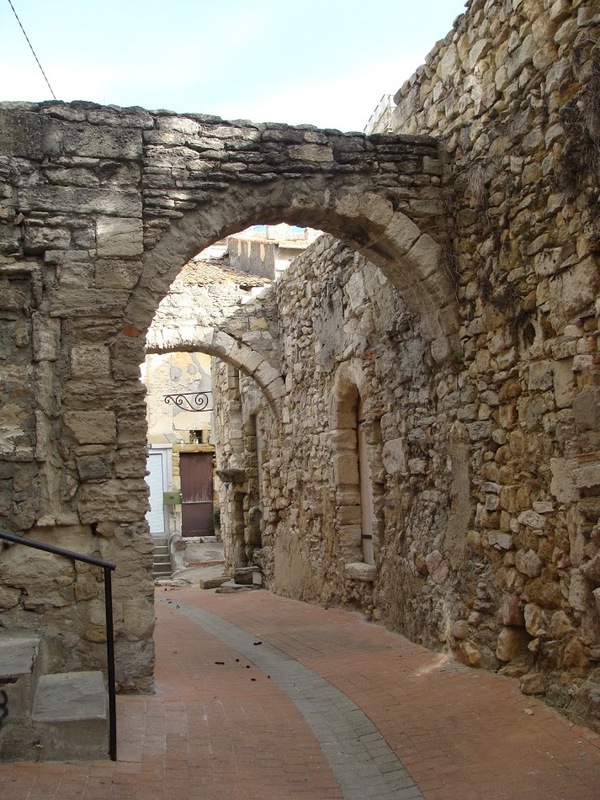 You will also cycle to the magnificent Abbey of Saint-Michel-de-Frigolet, and then down to the 17th-century castle of Barbentane, at the confluence of the Rhône and the Durance rivers. In spite of the several ups and downs, this spectacular route won’t disappoint you. Leaving Vallabrègues, you will pass little ancient villages and hillside vineyards to the best-preserved Roman aqueduct in all of Europe, the Pont du Gard. 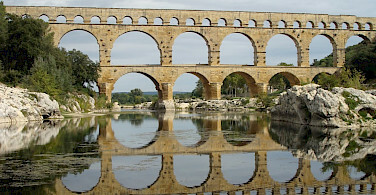 This bridge, with its three levels of stone arches, spans the Gardon Valley, being part of an aqueduct built during the 1st century in order to transport water from the Eure spring near Uzès to the Roman town of Nîmes, a distance of over 50 kilometers. 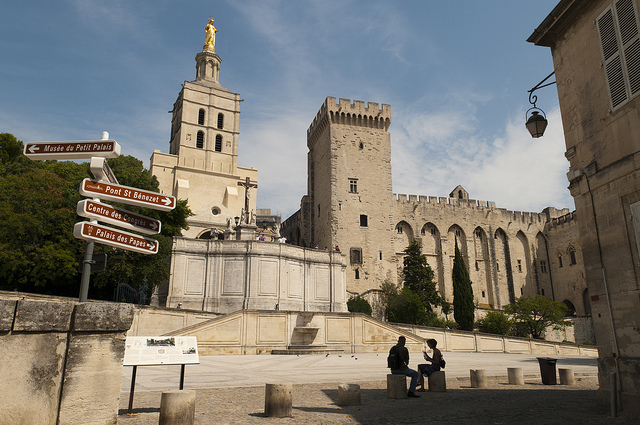 Your tour today will end in Villeneuve-lès-Avignon, which lies just in front of its elder “sister”, Avignon along the other bank of the Rhône. 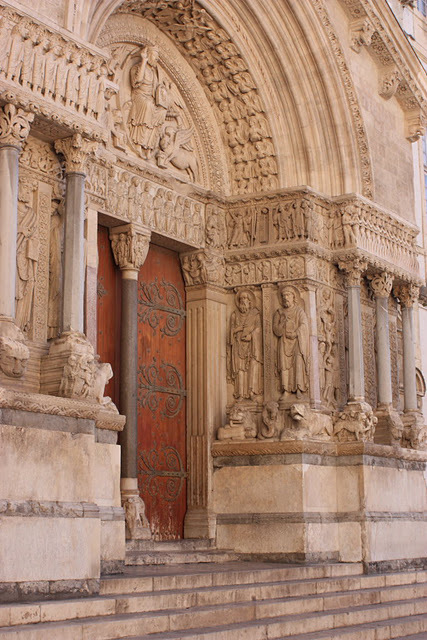 Avignon’s architecture is marked by papal history since in the early 14th century; the pontifical court was exiled to France. 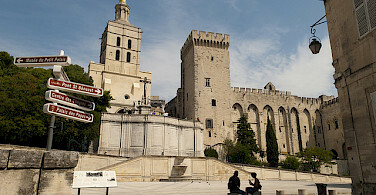 The cardinals, arriving at the papal court and finding no accommodation in Avignon, began to build magnificent residences across the river in Villeneuve (“new town”). The best place to enjoy Villeneuve, when you can catch a great view of the town including Avignon and the Mont Ventoux, is from the upper terrace of the Tour Philippe-le-Bel. 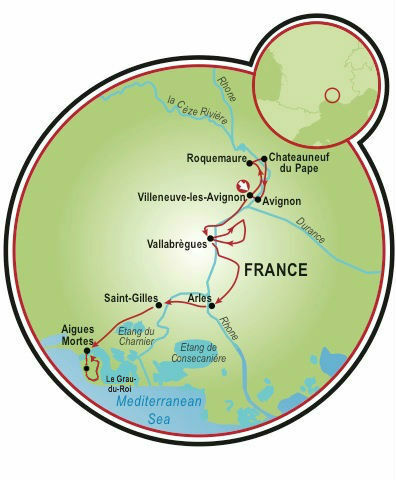 The day begins with a cruise up to Roquemaure or a cruise during breakfast to Avignon crossing the Rhône River and continues on bike in the direction of Châteauneuf-du-Pape. Following scenic country roads with little traffic and surrounded by vineyards, you will have to face some rolling landscapes before getting to Châteauneuf- du-Pape, but once you are there, you will never want to leave. After a visit to the ruined fortress of the Popes on the top of the village, a tasting of the most prestigious of all the Rhône wines can be organized if you desire. The easy road to Villeneuve will lead you through Avignon, giving you the opportunity to bike along its unique ramparts and to admire its legendary broken bridge (the Pont St-Bénézet). This tour is run by Cobie Lagerveld.